The nominations began last October and the winners have just been announced by the Magazine. BUILD is a quarterly digital publication, based out of England and showcases some of the most innovative leaders, creative brands and dedicated firms shaping the industry today from the world of architecture & design, engineering, and property. My award for “The Best Home Improvement Blog of 2019” was included as part of the Home and Garden Awards HERE. The purpose of these awards is to showcase businesses and enterprises that provide products and services which make our living environment not just a place in which we exist, but the embodiment of our hopes and dreams. The winners list HERE includes creative minds from landscaping and interior design to cleaners and carpenters. The Home and Garden Awards are designed to highlight those industries that truly make a house a home. Awards are based on skill, determination and dedication to ensuring our clients and customers can create their dream homes. To be included amongst these prestigious brands and companies is a great honor. I am very humbled to win this award, heck I am thrilled just to be nominated! 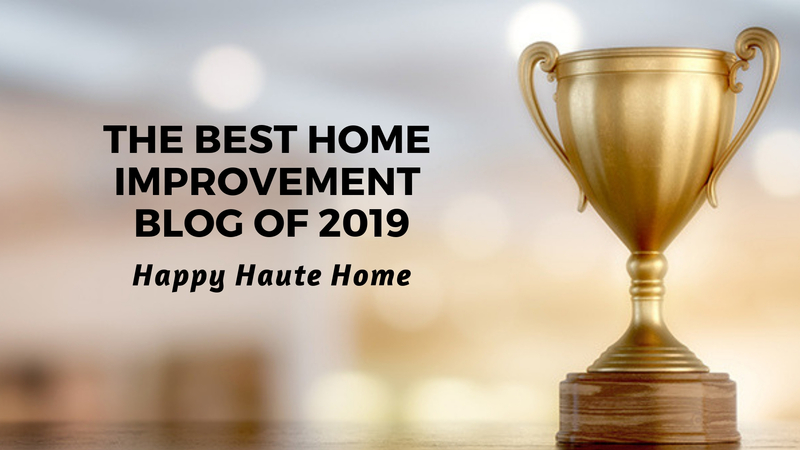 For more posts from The Best Home Improvement Blog of 2019, please subscribe to Happy Haute Home and follow along on Pinterest HERE, and Twitter HERE and feel free to pin and tweet your favorite pics from Happy Haute Home! How exciting! Congratulations Denise. I, for one, have enjoyed your blog immensely! Thanks Kristin!! I’m so happy to hear that, and so glad you enjoy the blog. Wow, congratulations Denise!!! Excellent job! You so deserve this award Denise. All your hard work pays off plus showcases your immense talent. Great pat on the back for you. A huge thanks to you!! I really appreciate you saying that and so happy you enjoy the blog! Thanks Bettye!! I am honored – hard work does pay off sometimes – in the smallest ways. Congratulations Denise! Your blog is excellent so it’s well-deserved! Thanks Barbara, you are so sweet. I appreciate your support and friendship.